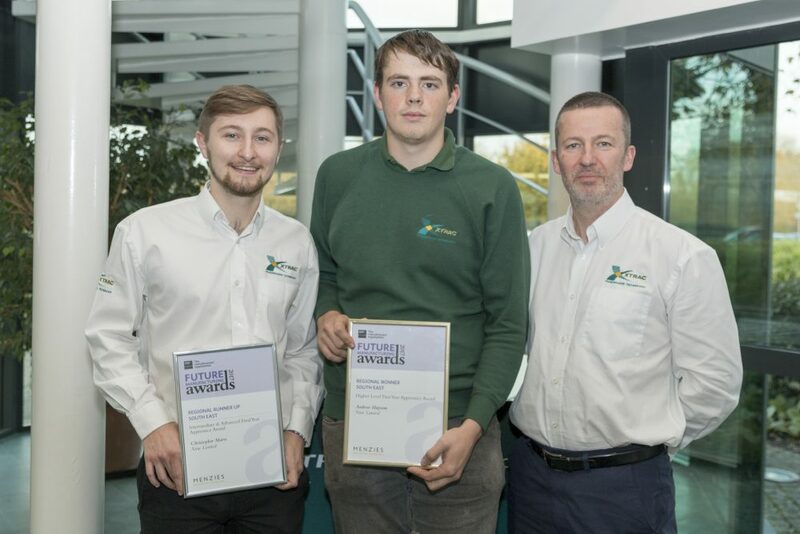 Andrew Haysom and Christopher Marrs, two of Xtrac’s current engineering apprentices, were both recognised at the recent south east regional EEF Future Manufacturing Awards. Now in their ninth year these awards are the most established and respected regional and national recognition of manufacturing success within the UK. The awards recognise companies and individuals for excellence in categories such as Business Growth, Innovation and Leadership along with several for Apprentices, recognising the importance of this vital training mechanism. The apprentice awards in particular, recognise the outstanding contribution being made by manufacturing apprentices across the region. First year apprentice Andrew Haysom won the Intermediate & Advanced First Year Apprentice Award. 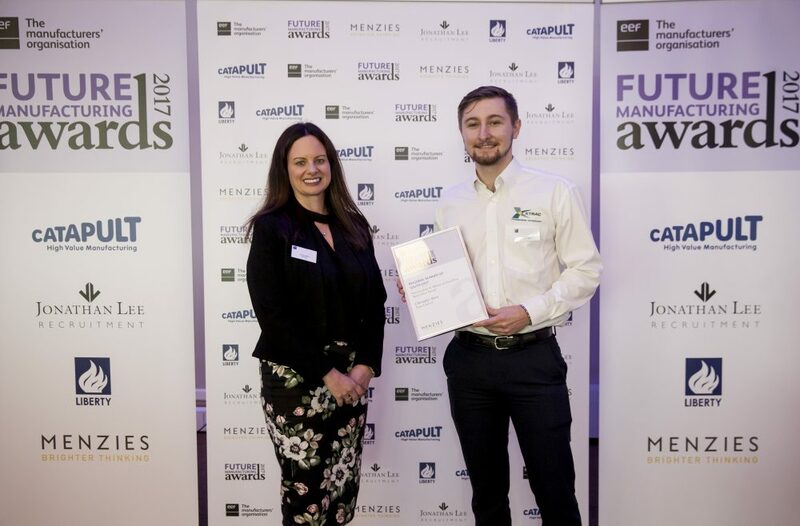 Having won the regional award, Andrew now progresses to compete in the EEF’s national winners awards at a prestigious gala dinner and awards ceremony in London on 25th January 2018. In his first year, Andrew has already spent time in the turning, milling and grinding departments and is currently working in the production engineering department before progressing through further manufacturing departments to gain experience in every aspect of Xtrac’s business. Xtrac’s apprentice scheme allows individuals to gain a thorough understanding of various manufacturing disciplines in their first year, allowing them to select and focus on their chosen area. 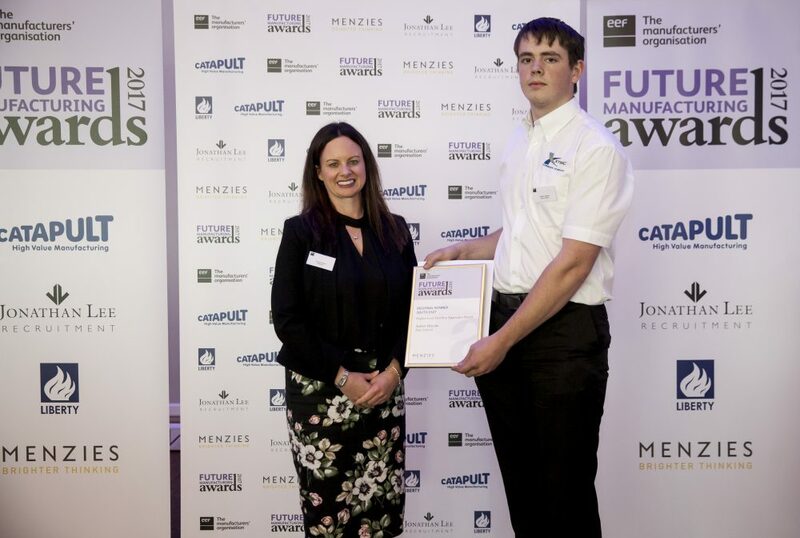 Chris Marrs received the runner up award in the Final Year Intermediate-Advanced Apprentice category. Now in his 3rd year at Xtrac, having completed his Advanced Apprenticeship early, Chris has progressed through the majority of the manufacturing departments and has chosen to specialise within the quality department and is now working as a Quality Engineer, a highly skilled role which delivers real value to the business. In addition to completing his apprenticeship, Chris is furthering his training and education with a degree apprenticeship due to complete in 2021. Xtrac have long recognised the benefits of training apprentices and our very first apprentice Simon Short is a testimony to this excellent method of training. Simon, who completed his apprenticeship in the 1990s, has developed his career and now holds the senior role of Build Shop Manager at Xtrac Inc., playing a key role in supporting our North and South American customers from our US base in Indianapolis. Each year Xtrac take at least 5 apprentices and provide full and extensive training, with well over 50 apprentices having been trained this way at Xtrac. The apprentice’s college work is taught by Newbury College with practical training provided in house by Xtrac. Applications for the 2018 intake apprentice programme have opened and full details can be found on Xtrac’s website. Andrew Haysom Collecting Intermediate & Advanced First Year Apprentice Award. Chris Marrs Collecting Runner Up Award - Final Year Intermediate-Advanced Apprentice. Chris Marrs (L) & Andrew Haysom (C) With Xtrac's Operations Director Martin Halley.